Mark Donnelly was born and educated in Lanarkshire. He studied under Elizabeth Izatt at The RSAMD and since graduating in 1992, has been enjoying a busy and varied career. He is the founder and conductor of the Bothwell Philharmonic Choir and has, in the 12 years since their inception, established them as a leading amateur choir with performances in the Royal Concert Hall, The Barony Hall and the SECC under their belt. Mark has been the guest of many leading choral societies and orchestras including The RSNO, The Scottish Symphony, The Scottish Chamber Orchestra and The Edinburgh Bach Choir. Performances in recital and oratorio have taken him to The Barbican Centre, London, The Royal Concert Hall, Glasgow, The Cowdray Hall, Aberdeen, The Usher Hall, Edinburgh and The Wigmore Hall, London. He has worked with leading conductors such as Sir Charles Mackerras, John Rutter and Ian Sutherland. International engagements have taken Mark to the Scots Kirk, Rome, Versailles Palace, Beijing, New Jersey, Philadelphia and Washington DC. Mark has been a guest soloist on more than one occasion at The West Sound Burns Supper, the largest in the world performing alongside All Angels, Darius, Only Men Aloud and Faryl Smith. Mark has been the winner of the Glasgow Royal Concert Hall’s Young Singer Competition, winner of the National Scot’s Song Prize, Twice a finalist in the International Mozart Competition, a finalist in the Mary Garden International Singing Prize and a semi-finalist in the Kathleen Ferrier Competition. 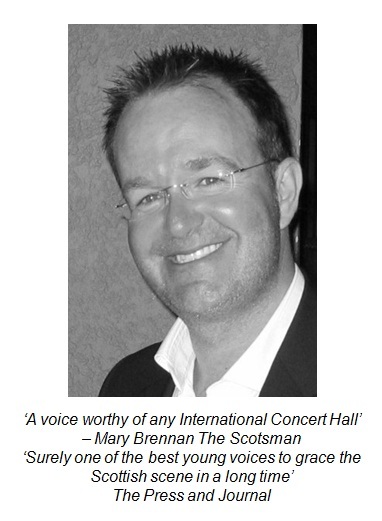 In addition to a busy singing schedule Mark is a renowned educationalist working as a consultant to several local authorities and has previously worked for the National Youth Chorus of Scotland and lead masterclasses for the Australian Girls’ Choir and St. Andrew’s Scot’s School, Buenos Aires. He combines his singing career, consultancy work, private teaching and conducting The Bothwell Philharmonic Choir with his day job, Head of Music at Craigholme School in Glasgow. Mark is married to Morven, a broadcast journalist. They have a daughter, Olivia and live in Bothwell.